I like how Ro is 10x more exited than mo. IM GOINV TO HAVE A NEPHEW!!!!!!! 2:05 Ro says: “ it will Roin it! Get it? I saw the blue from parchment paper. 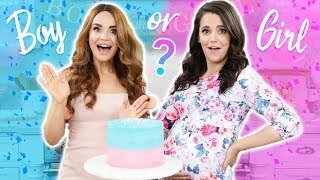 Who is watching this after her baby came out? How does 5k not like this ?? Ro: And now were gona bake the three cakes. Me:... THE THREE AMIGOS! Have a nice time being 🤰🏻🤱🏻. 6:46 Look closely at one of the pans You’re welcome. I'm making this cake for my gender reveal party in THREE WEEKS!!!!!!! I'm so happy for you mo!!! 8:09 doesn't this just give you a cotton candy vibe? or is that just me?